To facilitate comparisons, we've adjusted the two P/E ratios and Q Ratio to their arithmetic means and the inflation-adjusted S&P Composite to its exponential regression. We've plotted the S&P regression data as an area chart type rather than a line to make the comparisons a bit easier to read. Periods of over- and under-valuation can last for many years. To facilitate comparisons, we've adjusted the two P/E ratios and Q Ratio to their arithmetic means and the inflation-adjusted S&P Composite to its exponential regression. Thus the percentages on the vertical axis show the over/undervaluation as a percent above mean value, which we're using as a surrogate for fair value. Based on the latest S&P 500 monthly data, the market is overvalued somewhere in the range of 58% to 115%, depending on the indicator, up from 55% to 113% the previous month. We've plotted the S&P regression data as an area chart type rather than a line to make the comparisons a bit easier to read. It also reinforces the difference between the line charts - which are simple ratios - and the regression series, which measures the distance from an exponential regression on a log chart. The chart below differs from the one above in that the two valuation ratios (P/E and Q) are adjusted to their geometric mean rather than their arithmetic mean (which is what most people think of as the "average"). The geometric mean increases our attention to outliers. 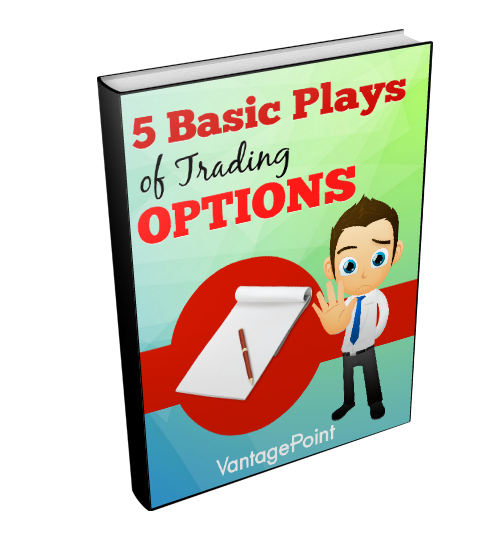 In our view, the first chart does a satisfactory job of illustrating these four approaches to market valuation, but we've included the geometric variant as an interesting alternative view for the two P/Es and Q. 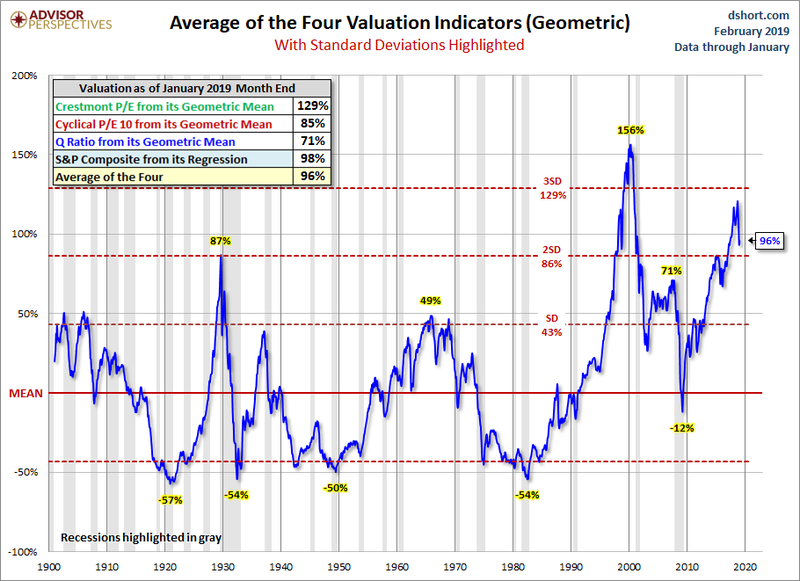 In this chart, the range of overvaluation would be in the range of 71% to 129%, up from last month's 67% to 126%. At the end of last month, the average of the four is 86% - up from 84% the previous month. Here is the same chart, this time with the geometric mean and deviations. The latest value of 96% is up from last month's 93%. As we've frequently pointed out, these indicators aren't useful as short-term signals of market direction. Periods of over- and under-valuation can last for many years. But they can play a role in framing longer-term expectations of investment returns. At present, market overvaluation continues to suggest a cautious long-term outlook and guarded expectations. However, at today's low annualized inflation rate and the extremely poor return on fixed income investments (Treasuries, CDs, etc.) the appeal of equities, despite overvaluation risk, is not surprising. 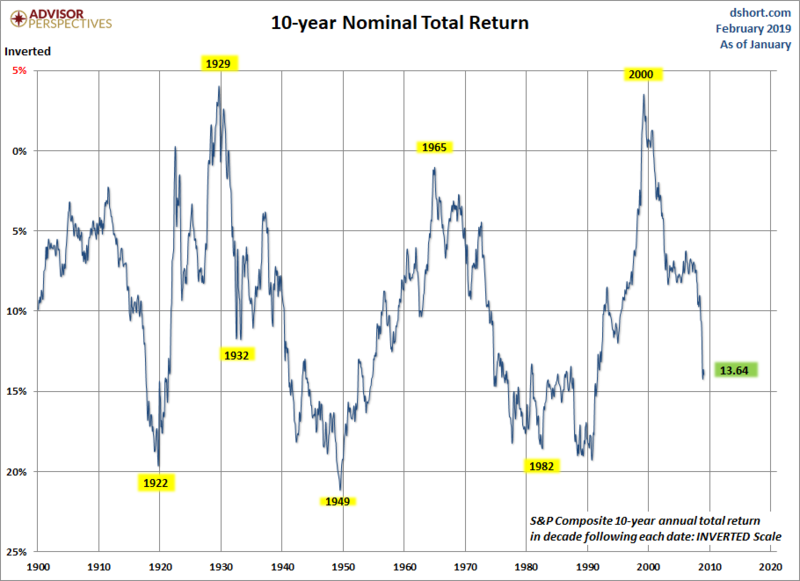 Many of our readers have requested we reproduce a chart by John Hussman that inverts the S&P 10-year total returns. 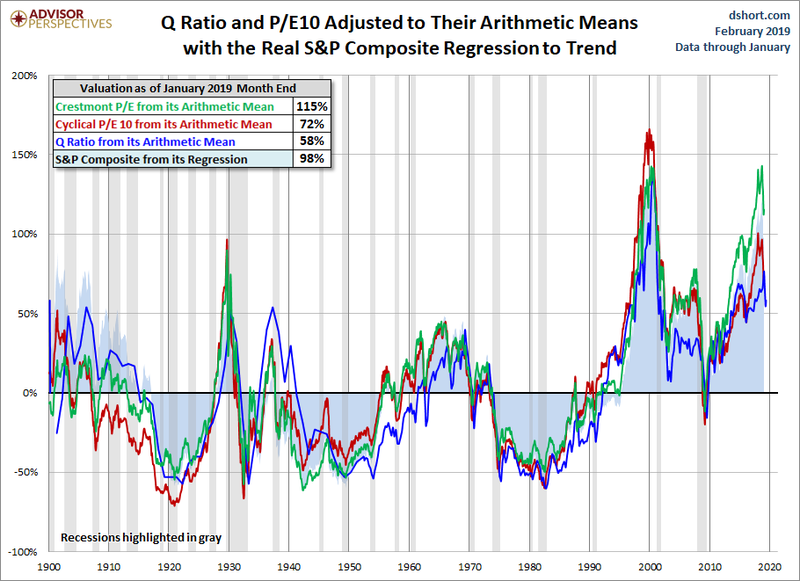 Hussman says "the most reliable correlation between valuations and subsequent returns is on a 12-year horizon, which is the point where the autocorrelation profile of valuations typically hits zero." 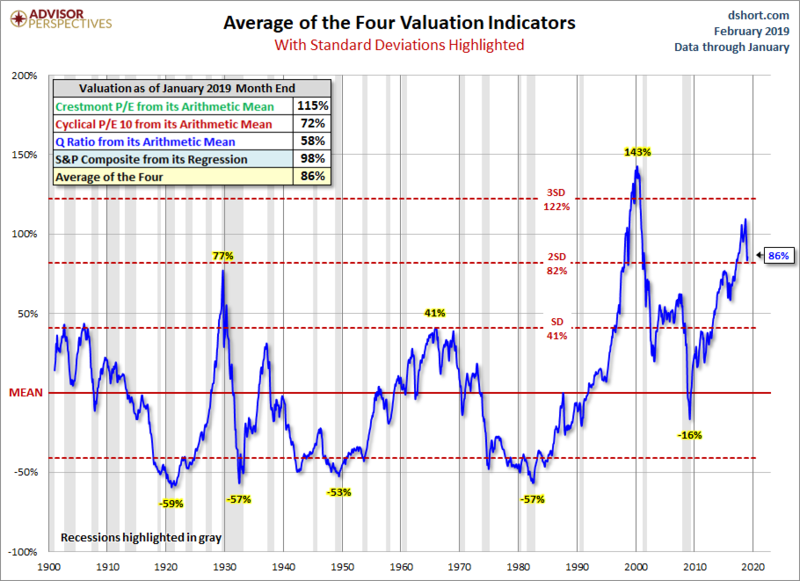 The correlation of valuations Hussman uses for comparison is at about 90%. 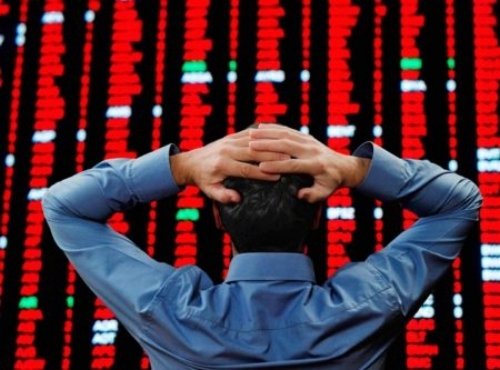 You will notice that nominal returns are used - this is a direct result of a sort of Fisher-effect in which inflation ends up being washed out of the calculation. The nominal growth rate of the economy is highly correlated with the level of interest rates, but also negatively correlated with market valuations, all over the same time period.